A 2011 The Guardian article highlighted that there is one camera for 32 people in the UK. This is definitely something that stands out and the infographic below highlights more information about the London underground stations, which are practically saturated with so many more cameras than you may believe at first glance. It is obvious that such an area needs to be guarded, especially after the terrorism scares and threats launched towards London by various terrorist organizations. The London Underground’s security has a total of 15,516 cameras. TFL (Transport for London) is responsible for capturing the images and insist that the number of cameras is high in order to prevent crime. Just as the infographic shows below, the average Londoner will be captured on a CCTV camera 13 times per day. Most CCTV cameras are installed at the King’s Cross St. Pancras Metropolitan Line and the infographic below only shows the top 10 stations. Canary Wharf Jubilee Line is last in the top ten with 167 cameras. The Londoner will surely not be surprised to notice how many cameras are present at King’s Cross St. Pancras road since its size is huge. We are faced with a national rail transport hub and even an international hub. The 408 cameras listed there are just those that are in the station. As expected, hundreds others are above the rail terminals. Every single London Underground station also features more cameras in the access points. Those are not presented in the inforgraphic. Leave your Big Brother concerns at home when thinking about being watched in the London Underground stations by the huge number of cameras present. The reason why they are installed has nothing to do with your day-to-day activities. The purpose for the addition of the cameras is purely security related. Images recorded are not released to the public and you can be sure that your privacy is protected. 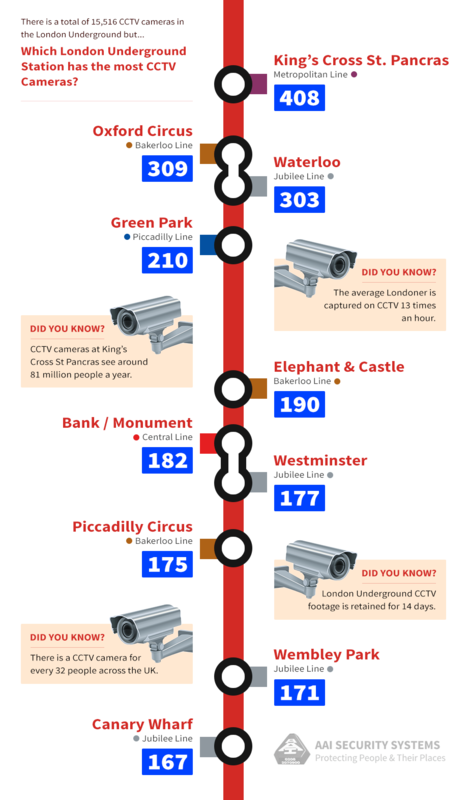 If you take a look at the infographic you will learn more about the top 10 London Underground stations according to the number of CCTV cameras included. We are sure you will also appreciate the tiny bits of information included as extras.